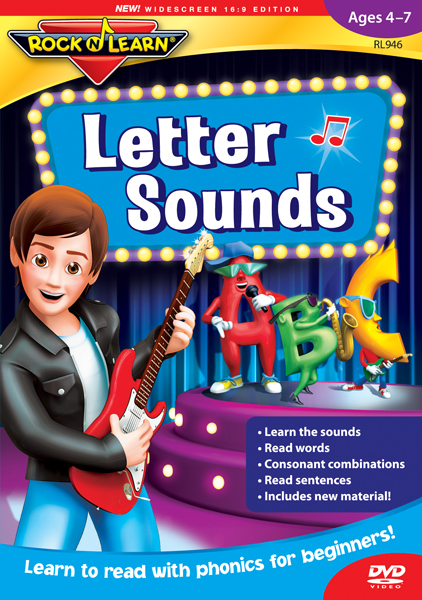 Learning to read is more fun than ever with this new version of Letter Sounds, Rock 'N Learn's best-selling DVD video. Engaging characters and more material help kids learn the skills to become competent readers. After a quick review of upper and lowercase letters, young learners practice the most common sound each letter makes. An on-screen mouth shows how to form the sounds. Excitement builds as kids race the clock to say letter sounds in silly sentences before hearing the answers. Then, learners play several games to solidify their understanding of letter-sound associations that will help them read and spell. Finally, after learning some common sight words, kids feel successful reading complete sentences and short stories.